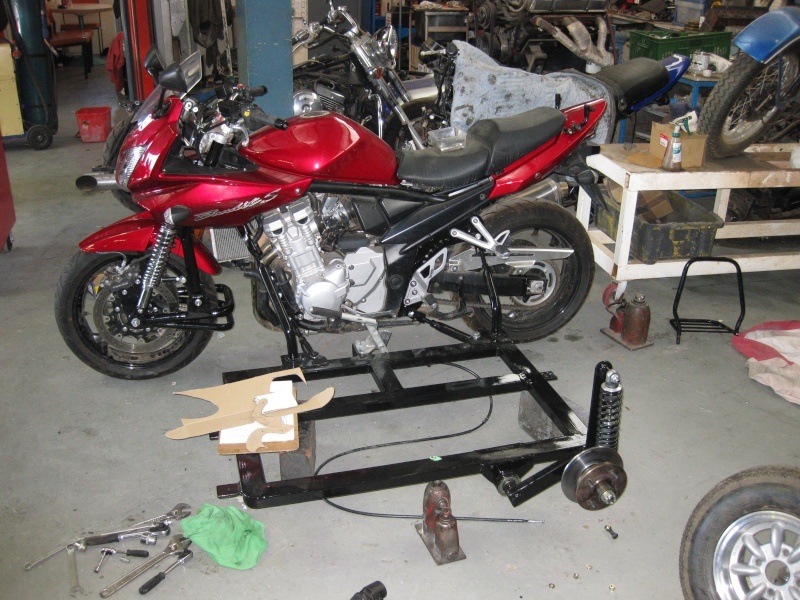 I have managed to find a sidecar for my 2007 GSF1250, waiting for its arrival, it is coming from Victoria. Hope my purchase is even half as good as I hope it is. 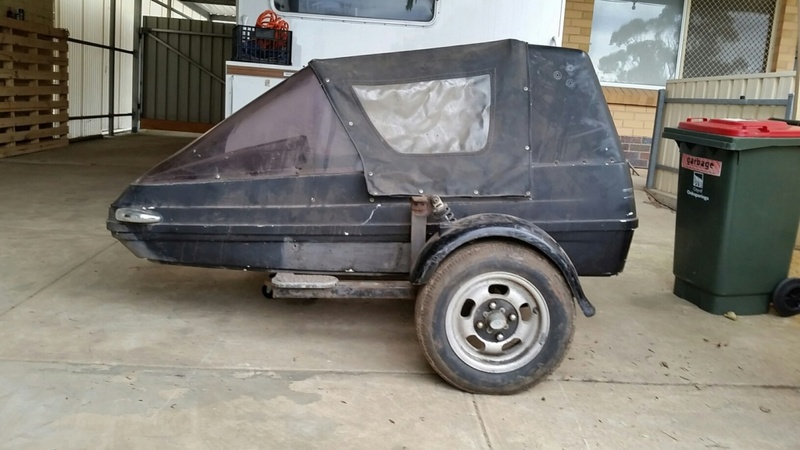 It was made by Southern Cross Australia, has a steel frame and a fibreglass body, it looks well made. Not sure of its age, can't find any history on the Internet. Anybody got any knowledge of this brand of sidecar? Will update this post as things progress, hoping to be a sidecar pilot again soon. Expect some news at the end of July, bike and sidecar should be attached by then. Shakedown and fine tuning may take a little while, wait and see. Location : Morphett Vale, S.A.
Good luck with this project, an Indian style out-rigger will look interesting. 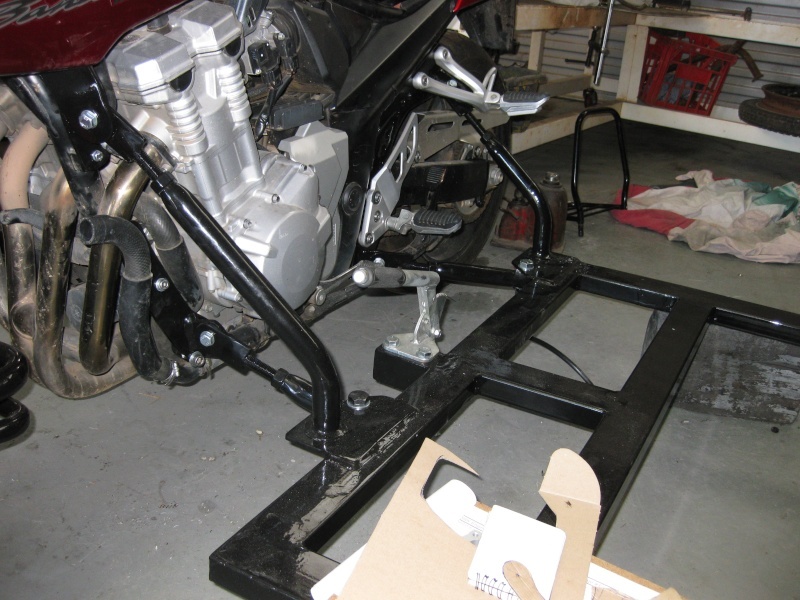 Can you buy leading link forks for the 1250 Bandit or do you have to make them yourself? You'd need a pretty good shed to make them yourself, plus they would need to be engineer certified to be used in most states as you have modified a major component. These are the parts that Sean built for mine, the leading link comprises most of the bits on the left half of the blanket. 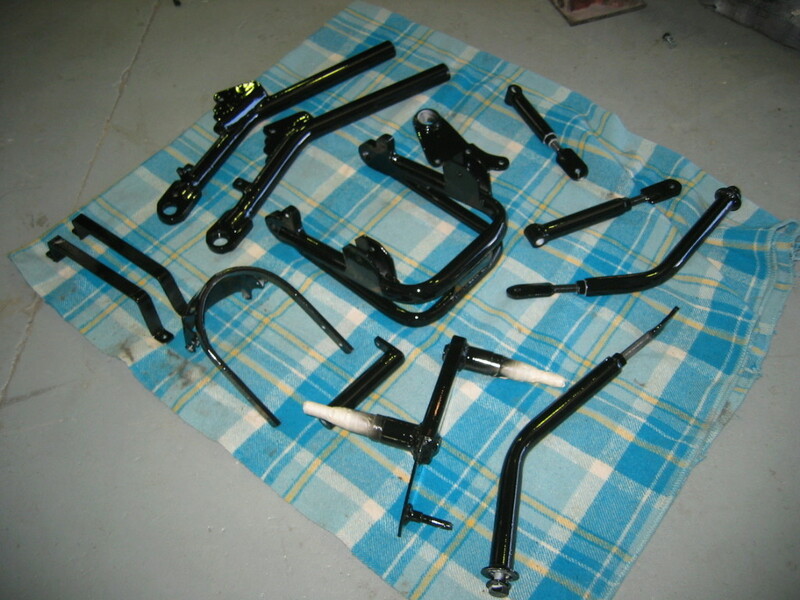 The other pieces are the four mounting struts and the sidecar axle/suspension arm. This doesn't show the parts he has welded to the bike frame. Thanks for dending the pictures. Can I be cheeky and ask how much the leading link cost. I got mine fitted at the same time the sidecar was made back in Dec 2009, so I had an all up price for the 2007 Bandit, sidecar, leading link, complete respray of the whole bike, sidecar tonneau cover, carpets, braided lines for front brakes, Ikon shocks bike front and sidecar, engineers report on both sidecar and leading link, plus a heavy duty 8x5 trailer to carry the rig - price for everything driveaway was $20,000 (including 12 months rego on bike and trailer). According to SRK's price list back then the Leading Link itself was $2,750. My sidecar is in the hands of the transport company at the moment, I should have it at my house by the weekend. I have a very good friend who has an engineering workshop.I need to find out the rego department requirements with regards to leading link forks, I can't afford to buy them at the price you have indicated. I think that this will be an interesting project. I will take pictures and make notes as I go unless I win the Lotto. Let me know if you need any assistance with measurements, photos etc. Should be a nice piece of kit when you finish it, looking forward to watching your progress. PM me your email address Mike and I'll see what info re: rego/engineering etc I can find out. As far as the sidecar fitment goes, just bolt it on and run with it (as long as it's bolted on the LH side) then get Motor Reg to change the body type from "Solo" to "Sidecar"
Actually have a copy of that document, the regs are rather vague which makes the job a lot easier. Sidecars seem to confuse the rego department in this state likewise some police officers. Waiting impatiently for my delivery to get here so I can see what needs done. It is an accepted modification, the onus is on you to make the mudguards, lighting etc to a acceptable standard then notify the rego department of "Body Type" change, nothing too confusing about that. Rear a red marker light. I used to joke that you could u-bolt a shopping trolley to your bike with a canoe strapped on top, use a bicycle front and rear lights. This could legally pass as a sidecar. You would never get away with it of course and I would never think of it for real. I do agree that fitting a sidecar should require engineering approval, it can just wait till I have mine on the road first! Bit excited, sidecar is in my driveway now. It got here early, I wasn't expecting it till tomorrow or maybe even Monday. I have first pictures but I don't know how to attach them. The sidecar body and chassis need a darn good clean up and a bit of paint. Will start work on it soon. @Mike Ford wrote: Bit excited, sidecar is in my driveway now. It got here early, I wasn't expecting it till tomorrow or maybe even Monday. I have first pictures but I don't know how to attach them. The sidecar body and chassis need a darn good clean up and a bit of paint. Will start work on it soon. Congratulations all round! She'll come up a treat. Will you need to beef up the brakes or do sidecars come with braked wheels? nope just looked a bit closer at the photos and seee the brake disc - Nice. I still want one, but too much other stuff going on to get one. Look forward to the outcome. No brake on the sidecar at the moment. I will have to fit one to use as a parking brake which is a legal requirement. Just another item on the list of things to do. 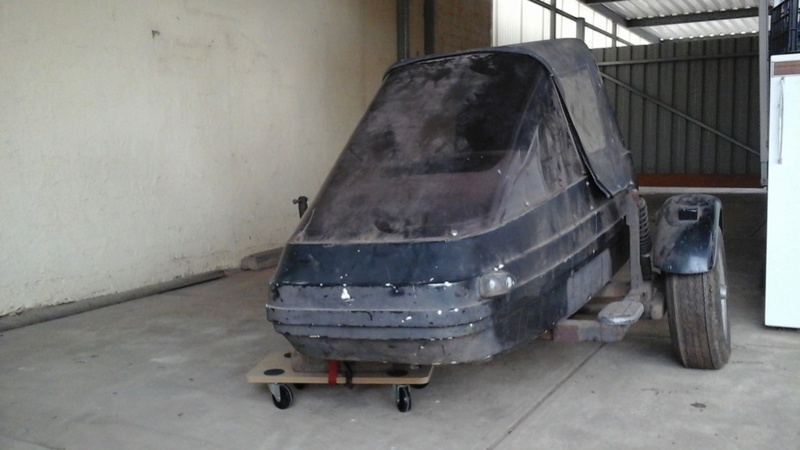 I separated the boat and frame yesterday, now some serious work can get started. Closer examination of the sidecar chassis indicates that the current boat is not the original, there are some extra tabs welded on to attach the current boat. Further checking of the sidecar boat shows that it has had a different mudgaurd for a while, one that was in very close proximity to the boat as indicated by faded paintwork showing the outline. The mystery of the boats origins may never be solved, maybe someone out there can help! Looking at the side view, it appears to me that the radius of the mudguard doesn't match the wheel, it's come from something with a slightly smaller wheel diameter. Having the suspension and swing arm exposed seems unusual as well, I recon the original boat had a body that covered both the wheel and suspension. Got a new tyre on the rim, 155/70r12 for $90, new wheel bearings bought ready to install, greased the axle pivot, started to clean up the sidecar chassis. A bump has arrived in the plans, my grand daughter decided that she needed to be here 4 weeks ahead of her scheduled arrival. Sidecar plans have been deferred, will get back on track as soon as able. Family comes first. Sidecar can wait!